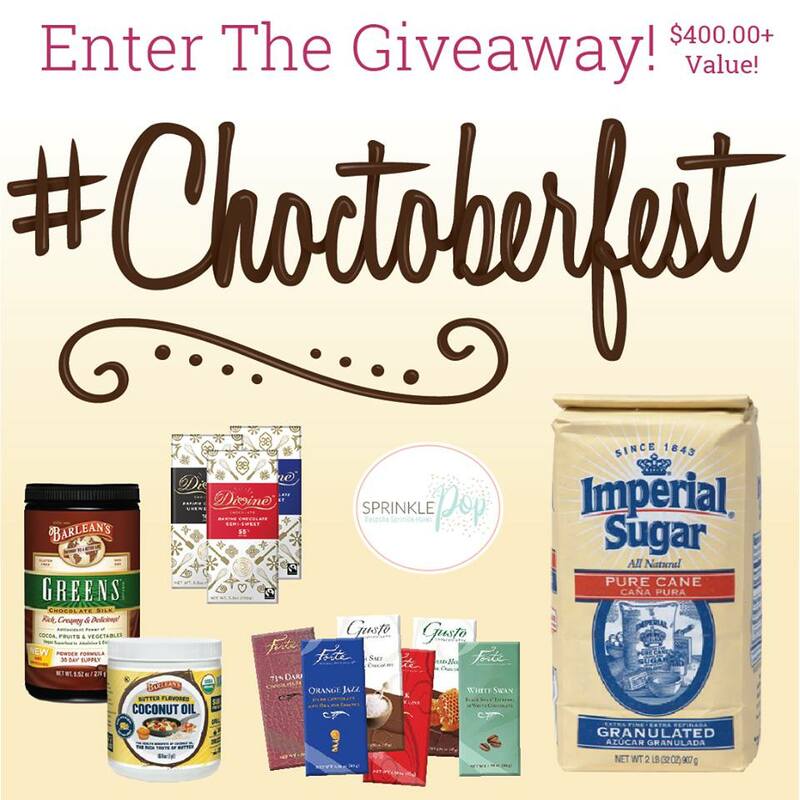 I hope you are enjoying #Choctoberfest so far, I know I am! Forte Chocolates sent me a selection of bars to use in creating my recipes for this event, and one of the varieties included was Balsamic Vinegar in White Chocolate. I started thinking about all the things that I would pair with balsamic, and figs seemed like the perfect way to go. Unfortunately, I couldn't find fresh figs, but I did find some beautiful fig jam at the farmer's market. 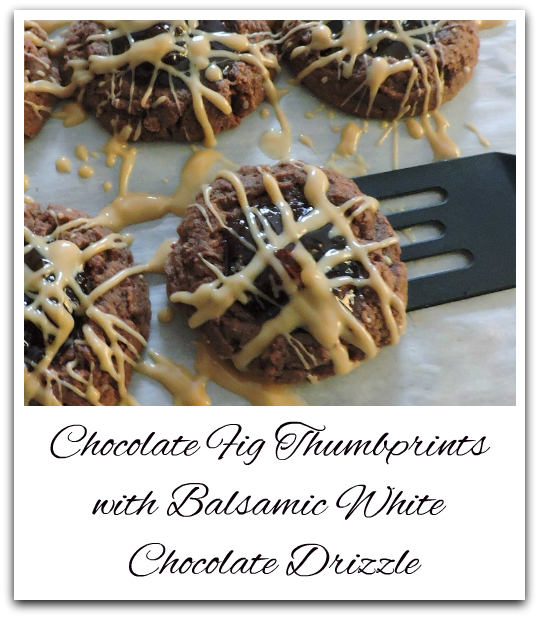 I went with a chocolate base for the cookie, but you could also use a classic thumbprint dough. I simply substituted 1/4c cocoa powder for the flour in my family favorite recipe. If you don't care for fig, these would be amazing with strawberry preserves too. I melted the white chocolate with a little bit of vegetable oil in a glass bowl in the microwave. Make sure to do it in short increments, and stir. I may have gone a little overboard with my drizzling, but it's so good! Thank you so much to Forte Chocolates for sponsoring Choctoberfest! 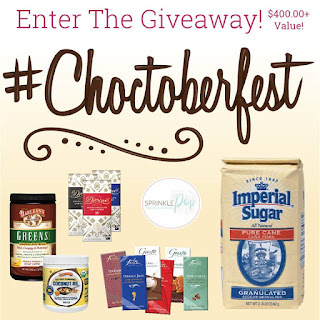 Go check out their amazing selection of products here, and if you use the code CHOCTOBERFEST2018, you can buy 3 and get one FREE! Don't forget to go and enter for your chance to win the prize package from our amazing sponsors! You can read about the prizes here. Preheat oven to 375º. Cream together brown sugar and butter. Add egg yolks and vanilla, mix well. Stir in flour, cocoa, and salt. Roll into 1 inch balls. Place on ungreased baking sheets 1" apart. Bake for 5 minutes. Remove from oven. Quickly indent each cookie center with thumb. Bake 8 minutes longer. Cool completely. Spoon jam into each indentation. Melt white choc with oil until smooth. Drizzle over cookies with a fork. Makes about 2 dozen. *I line sheets with parchment paper, and use a cookie scoop to get uniform balls. I also used a Pampered chef tart press to make the indents. Thanks, finally got it to work..I'm so excited! Never have won but I'm entering this one ..love the prizes OMG thank you so much. What an interesting and delicious flavor combination. They sound delicious. Yum, that looks so good! I did not get to try out the balsamic chocolate, but I really want to. Guess I should go order some!